Summer said its final goodbyes, and we’re enjoying the cooler temperatures and the colors being painted by Mother Nature with the entrance of this new fall season in Georgia. According to the Farmer’s Almanac long range weather forecast for the Southeast, we will have above average temperatures of 65 degrees and below average precipitation of 2 inches. You may be wondering if it’s a good time to lay sod in your yard, or if you missed your opportunity until next spring and summer rolls around. While it’s usually recommended by horticulturists that sodding is a more risky endeavor while the grass is dormant, it is still not an uncommon practice to lay it in the fall. According to Walter Reeves, “If grasses like bermuda grass, centipede grass, St. Augustine grass and zoysia grass, are going to be established while dormant there are management practices that can improve the chances of success.” He suggests that root zone preparation is critical for successful sod growth while dormant. The site preparation includes the taking of a soil sample prior to turf grass establishment to determine the pH and nutrient needs. 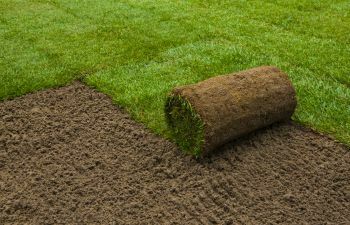 After the needs are determined, modifications to the soil can be made to ensure the health of your sod. For all your landscape needs, contact Southern Landscape Supply today. We understand that if we do not take care of you, someone else will. For that reason, we partnered with Sumter Sod for all of your sod needs. Call us today to see how we can help you.